Stellar is one of those cryptocurrencies that are popular to use both within blockchain-focused communities and traditional businesses. Stellar provides advanced speed of transactions, is customizable and highly accessible. However, 2018 wasn’t an easy year for the coin. That year was the toughest in the XLM price history. But there is also a bright side to this, as the coin currently has an opportunity to significantly increase its price in the following year. Stellar is one of the altcoins that weren’t designed based on the Bitcoin’s source code. The Stellar platform is a provider of foreign exchange transactions that operates in real time via its internal coin – Stellar Lumens (XLM). It was founded by Jed McCaleb and Joyce Kim while they were still working on the Ripple system in the early 2014. The coin was later re established as an independent project powered with by Stellar Lumens. Stellar is now developed by the Stellar Development Foundation, an organization founded to support the maintenance and funding of the crypto. However, Stellar is more than just a cryptocoin. The Stellar project established a number of different services on top of the platform. The project currently offers token issuance, decentralized exchange and a desktop client. The coin also provides the Horizon API, a solution that offers the usage of the Stellar technologies to build new applications. The wide technological functions of the coin improved both Stellar price predictions and its implementation opportunities. Stellar is already implemented in the business processes of such companies as Deloitte, Parkway Projects and some others. The enterprise-friendliness of the coin is often stated as one of the main reasons behind the positivity of most XLM price predictions. Note: the XLM price history graph presented above is logarithmic, so the real difference in the height of its peaks is more significant than it looks. Stellar Lumens, the units of digital currency of the project have a low price per coin. These coins are mostly bought (or invested in) in significant numbers. For almost three years after the platform’s deployment the price of the coin was around 0.2 cents. The Stellar price history chart shows that the first significant increase in the XLM’s price happened in May, 2017. Its value came close to be a little over 5 cents per coin; the coin price was 25 times it value in the previous years. Another major jump of its price started in November, 2017. The ascending trend peaked in January 4th, 2018, when the price reached its current record of 85 cents. Since its peak in January, Stellars price is on a downtrend. However, unlike other cryptocurrencies (most of which are also descending in price), XLM’s volatility provided the coin with several significant increases in the price too. The Stellar price analysis shows that the coin experienced significant growth in April and July. Nevertheless, Stellar price is now ten times lower than it was at the start of the year. There are three scenarios that seem probable in terms the XLM price prediction for 2019. The first one is a negative Stellar price prediction based on the presupposition that the whole market will remain in its current downtrend. XLM price analysis shows that its price isn’t in 100% connection to the market – the coin had already been presenting a significant growth outside of the market fluctuations. However, the current market crisis affects the coin prominently and it doesn’t seem likely for Stellar to stand out in the industry and increase in price despite the current market movement. In case mentioned presupposition turns out true, the coin will likely return to the value of around 3 or 4 cents. On the other hand, the rest Stellar price predictions for 2019 are much more positive. The most likely scenario for the coin’s price is its future growth alongside the market growth. There is no reason to suspect that the XLM price will remain in the downtrend in case the cryptocurrency market starts to regain its expansion. XLM is one of the most famous and trusted products of the industry so it will surely show no less growth than the other market participants. However, it is not obvious that the market will stop the downtrend in the nearest future. It is possible that there will be no significant market growth and it will remain in stagnation until the late spring. Still, the overall expectation for 2019 is favorable. The moderate Stellar price prediction for the year is 50-60 cents per coin, which is 5 times its current price. The last scenario for the Stellar price forecast is its return to the current price peak of over 80 cents. While it is too unlikely for the market to show one more boom, the Stellar cryptocurrency itself is totally able to show an independent leap forward in price. Some newly developed technology and even one prominent deal with an enterprise of, for example, Microsoft’s magnitude will provide the coin with a stellar increase in price. 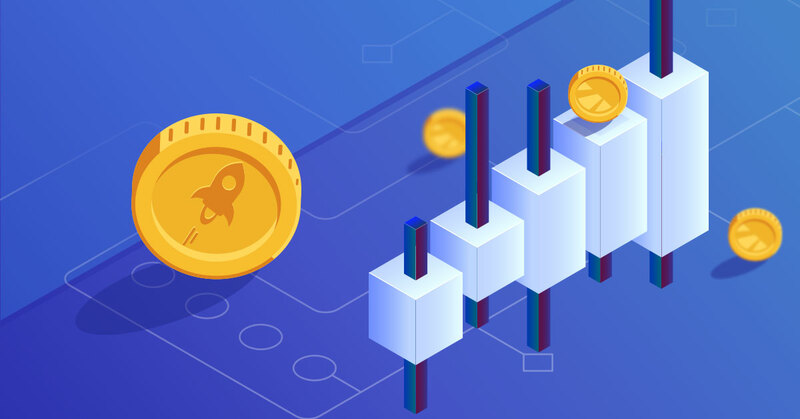 The XLM price prediction for 2020 and further is very positive due to the fact that the coin possesses one of the most advanced development team in the industry. Technologies, provided by the team made the coin both versatile and robust. These features provided the coin with business-friendly services and wide range of use cases for the community of private users. It is harder to identify some particular price the XLM’s price in 2020 but it has all the necessary prerequisite to show a prominent and positive change in price. Current exchange rate of Stellar can be found here. I was reading some of your posts on this website and I think this website is rattling informative ! Keep on putting up.